Jason Colebrook hasn’t travelled to Nebraska looking for adventure – he wants revenge. 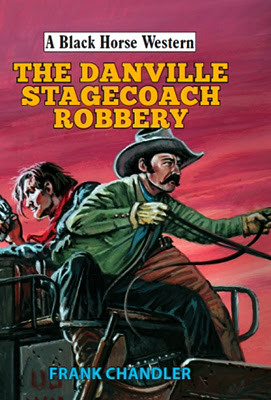 Travelling on the Danville stagecoach as a young lad, he survived the robbery but was badly wounded. Twenty years later, determined to uncover the truth, he gets a lead to a frontier town where he finds the townspeople are being cheated by a man running for election. Jason soon falls foul of a local gang, but also falls for a beautiful redhead only to discover she is entangled in a network of corruption, evictions and underhand dealings. Although help arrives unexpectedly from the local hotel owner’s daughter, Jason has to use all his cunning, determination and gun skills to unmask his quarry and see justice is done. As far as I can tell this is the first Black Horse Western to front the author name Frank Chandler and the book he presents the reader with is filled with twists and turns, surprises and action. The book opens with a couple of encounters for Colebrook that paint a clear picture of the kind of man he is, someone who will step in when help is needed without a second thought to his well-being. One of these face-offs is referred to a few times during the story with humour. The author also keeps the tale of what actually happened on the Danville stagecoach and the reason the young Colebrook was shot a secret until near the end of the book. The reason behind this being just one of the hooks that kept me eagerly turning the pages. Another was the mystery of just who would turn out to be the men Colebrook was hunting. The political corruption forms another storyline that may be tied in with Colebrook’s mission for vengeance or not – you’ll have to read the book to find that out for yourself. And then there’s the added complication of the two women, both very strong characters who know what they want and will go out and get it rather than wait for it to come to them. Overall I found this to be a very entertaining read that easily held my interest throughout with its fast-moving pace and twisting plotline. Trinidad, New Mexico, is an oasis of civilization in an untamed desert ruled by outlaws, bank robbers and horse thieves. 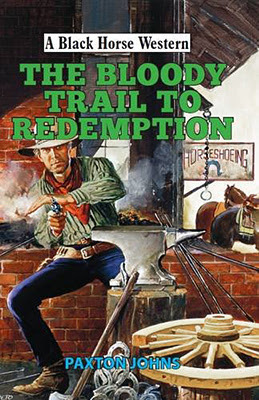 Sheriff Harry Gauge rules his town with an iron fist, a fast gun, and an unbridled thirst for power. George Cullen sweated blood to carve a ranch from the wilderness. He’d rather take a bullet to the gut than give in to the greedy sheriff’s land grab. But a cattle empire isn’t all Gauge wants – he also has his eye on Cullen’s beautiful daughter Willa. Cullen gets word out that he’s hiring the fastest gunslinger money can buy to take on the sheriff. When a stranger rides in, townsfolk wonder if this is the rancher’s hired gun. Wherever he came from, wherever he’s going, two things are clear – the stranger won’t be pushed…and his aim is deadly. Collins has written a book that is extremely readable. Due to when the screenplay was written you can easily imagine it as a film from the 1960’s or perhaps the 1970’s. Having said that Collins has adapted it so it doesn’t appear dated. Occasionally it has the feel of one of those hard-hitting detective films full of tough men and equally as hard women that Spillane wrote about in his Mike Hammer novels. All this, and some fairly graphic violence, mix perfectly to result in a top class western read that should please all fans of the genre. There’s a couple of neat twists, and some great mystery surrounding the Stranger’s identity, surely he is Banion, the man who killed Caleb York? Sheriff Gauge, a lightning fast gun himself doesn’t care who the Stranger is, just knows he’s a man to be got rid of in any way possible. The Stranger also has two women to deal with but can the fact that he is a killer be overcome by one of them so her true feeling can emerge? 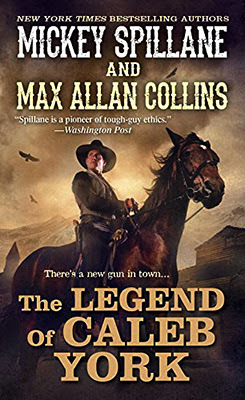 For the seasoned western reader the plot falls under the banner of traditional but there’s nothing wrong with that, especially as I’ve already said the book is so well written by Max Allan Collins that it is a pleasure to read. So much so that I am looking forward to reading the sequel, The Big Showdown, that is already available as a hardcover and is due out in paperback next March. The stagecoach from the north has failed to arrive in the small settlement of Laramie, and when two men ride in fresh from a fight in the southern long-grass country, the inhabitants begin to fear that the rumoured unrest among the Sioux following the discovery of gold in the Black Hills has become reality. Their concerns are relayed to the nearby fort, where visiting wagon-train scout Wes Gray agrees to join an army patrol party sent to find the missing coach. 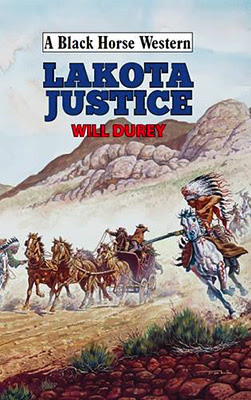 Although doubtful that the Sioux have begun hostilities, he is compelled to investigate the matter for the safety of those travelling west in the nearby wagons, but the discovery of an empty coach is only the first step along a trail which includes murder, kidnapping and inter-tribal warfare, and subjects Wes to extremes of personal violence and humiliation. This is the third in the Wes Gray series, a fourth is due out in November of this year. It is the first I’ve read about this scout but not the first book I’ve read by Will DuRey. Not having realized the book was part of a series I found that the story read well as a stand-alone tale. What I took to be fleshing out of Wes Gray’s back story I can now see would be told in greater detail in the earlier books, and my enjoyment of this one certainly has me wanting to read those first two. Fast moving and action packed, and including a number of how-will-he-get-out-of-that situations such as the humiliation and torture that Gray endures, the story definitely holds the readers’ attention from beginning to end. DuRey has created a great set of characters in all the races you’ll encounter in this book, be they good or bad, male or female. When justice is delivered it could mean grave consequences for those left alive and Gray has to think fast for a solution that won’t see the plains erupt in an all-out bloodbath. Once more Will DuRey has left me feeling thoroughly entertained and looking forward to his next book, which just happens to be the next in the Wes Gray series and that’s a story I’m looking forward to reading. English aristocrat Born Gallant is riding to Dodge City to meet up with old friends, when he is attacked and left to die. Initially relieved when rescued by a lawman and his posse, Gallant’s fortunes take a turn for the worse when his apparent rescuers accuse him of murder. A witness has sworn that he saw him stab the Kansas senator, and it seems certain that Gallant will hang for a murder he did not commit. Gallant’s old friends newspaperman Stick McCrae and lawyer Melody Lake are able to rescue him from his predicament, but disaster after disaster befall the trio as it becomes increasingly apparent that several people want him dead. A web of political intrigue and vengeance is uncovered, but will Gallant be able to unmask the true murderer before he himself becomes a victim? This is the third book to feature Born Gallant and although it is a self-contained story it does reveal a lot about what has happened in the previous stories, so it may be worthwhile tracking those down and reading them before this one. Whichever choice you make I’m sure that you’ll enjoy this book as much as I did. Paxton Johns is a thinly disguised pseudonym used by John Paxton Sheriff for this series about Born Gallant. I’ve been a fan of Sheriff’s work for a long time (he writes under a fistful of other names too) and always enjoy his twisting plots that offer plenty of surprises. This book grips from the opening scenes and will have you struggling to work out what is going on along with Gallant and his two companions. Every time they seem to be getting somewhere someone else pops up with a gun, a threat of jail, or a comment that destroys their theories. All this makes for a very entertaining read that left me hoping we haven’t seen the last of Born Gallant even though the last paragraph of the story perhaps hints that we have.